Adjacent to the Electric Universe Conference 2016 – Elegant Simplicity (17 – 19 June in Phoenix, Arizona) there will be an Electric Universe Geology themed tour through the southwest USA. The tour will start on the 20th after the conference and end on the evening of the 25th. Tour contacts: Mark Spann, Julian West and Andreas Otte. 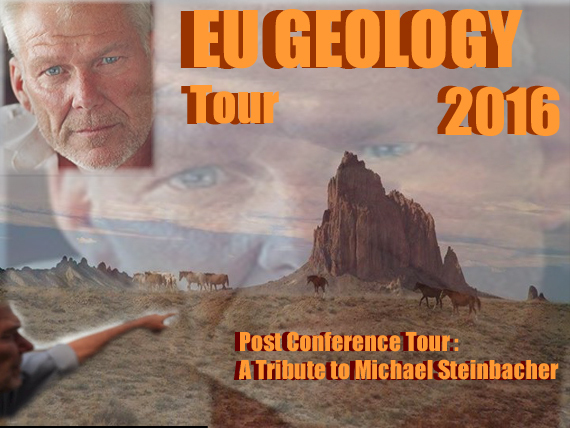 Due to Michael’s current health status there will not be an official EU Geology tour immediately before or after the EU 2015 conference. Suspiciuos Observers has a new introductionary video up on Michael Steinbacher’s Electric Universe Geology. The paper supposes comets are composed largely of ice, contrary to EU concepts. That being said, the caption under the image of comet Halley claims there might be 500 years of OPEC production on Comet Halley. I think that’s about 4 trillion barrels. That’s about the same as the Green River Basin in the western US. The paragraph concerning Halley’s tail claims there are hydrocarbons almost identical to oil shale. This info from a satellite fly bye. Under the heading of Other “Nearby” Periodic comets it claims all 150 comets are rich in hydrocarbons and water ice. While hosting a geology tour one year ago, we passed the formation from the link below. It has layers of dark material that might be coal or shale. The only way to get such vertical layers from a dune would be to have the formation fold after deposition. That seemed possible but something of a stretch. This caused a re-examination of the dune process. Sand dunes grow with the direction of the wind. Dry sand bounces along the desert and up the windward side of a dune. When the bouncing sand gets to the ridge, the sand falls down the slip face, increasing the size of the dune in the direction of the wind. If the blowing material was wet, conglomerate (dirt with various sizes of rocks), or molten, it would stick to the windward side and grow up and back into the wind. This now appears to be the process I misconstrued as duning. I was only wrong by 180 degrees. Adjacent to the Electric Universe Conference 2014 – All About Evidence (20.-24. March in Albuquerque) there will be an EUG-themed (Electric Universe Geology) tour through the southwest USA. Current planning targets three days before (17th to 19th) and ten days after the conference (25th to 3rd).